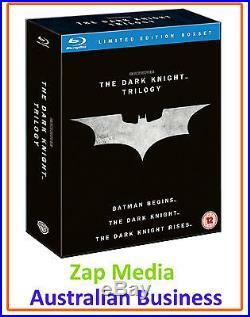 THE DARK KNIGHT TRILOGY - BLU RAY COLLECTION. DVD Release Date: 3 Dec 2012. Including all three films from Christopher Nolan's Batman trilogy and a special book. The Art and Making of The Dark Knight Trilogy. Designed by world-renowned graphic designer Chip Kidd. Tells the complete behind-the-scenes story of these influential films. Based on in-depth interviews with Nolan and all of the films' key cast and crew. Goyer and Jonathan Nolan, cinematographer Wally Pfister, and more--this slimmed down version of the original reveals the creative process behind the epic. Accented by beautiful artwork and never-before-seen set photography. Audio: Dolby true HD: English 5.1, Dolby Digital: English 5.1, Castilian Spanish 5.1, French 5.1, German 5.1, Italian 5.1 Aspect Ratio: 16X9 Run Time: 140 Mins. 1 Disc Subtitles: English, Castilian Spanish, Danish, Dutch, Finnish, French, German, Italian, Norwegian, Portuguese, Swedish UltraViolet Digital Copy Expiry Date: 2nd December 2014 Extra Content. The Dark Knight IMAX Prologue. Reflections on Writing Batman Begins. Audio: Dolby true HD: English 5.1. Dolby digital: English 5.1, Brazilian portugeuse 5.1, Castilian Spanish 5.1, French 5.1, German 5.1, Italian 5.1, English 2.0, Audio descriptive service. Aspect Ratio: 16X9 Run Time: 153 Mins. 2 Discs Subtitles: English, Brazilian Portuguese, Castilian Spanish, Complex Chinese, Danish, Dutch, Finnish, French, German, Italian, Korean, Spanish, Norwegian, Portuguese, Swedish UltraViolet Digital Copy Expiry Date: 2nd December 2014. Audio: Thai (5.1 DD), Castilian Spanish (5.1 DD), Japanese (5.1 DD), Italian (5.1 DD), German (5.1 DD), French (5.1 DD), English (5.1 ASDA), English (2.0 NF DD), English (5.1 NF DTS-HDMA) Aspect Ratio: 16X9 FF Run Time: 164 Mins. 2 Discs Subtitles: German, French, Dutch, Chinese complex, Cantonese, Bahasa - Indonesia, German SDH, Italian, Italian SDH, Japanese, Korean, Castilian Spanish, Thai, Dannish, Finnish, Norwegian, Swedish, Icelandic, French, English SDH UltraViolet Digital Copy Expiry Date: 2nd December 2014. The Batmobile- Witness all five Bat mobiles together for the first time in history. Dive deep into every aspect of the most awe-inspiring pinnacle of technology as the most awe-inspiring weapon in Birth and evolution of this technological marvel and cultural icon. The Prologue: High-Altitude Hijacking- Production - Ending the Knight- See how Christopher Nolan and his filmmaking team staged the film's high-flying opening sequence. Return to the Batcave- Production - Witness the reconstruction of the Batcave with time-lapse photography. Beneath Gotham- Director Christopher Nolan and the production designers discuss the design and build of Bane's lair. The Bat Pod - Director Christopher Nolan gives Batman a new mode of transportation in The Dark Knight Rises. Batman vs Bane- The filmmakers and actors reveal how they planned and shot the epic fight sequence between Batman and Bane. Armory Accepted- See how special effects and a miniature unit were used to simulate the demolition drop of the Tumbler through the ceiling. Gameday Destruction -The filmmakers describe the production plan that went into executing the jaw-dropping demolition sequence at Gotham Stadium. Demolishing a City Street- Learn how a series of practical special effects were used to simulate the complete destruction of a city street. The Pit -The filmmakers explain the design and construction of two giant, vertical sets: the underground prison and the well. The Chant- Christopher Nolan and Hans Zimmer discuss the creation of the chant that formed the basis of the score's. The War on Wall Street- Get a glimpse behind the coordination and production of the epic battle for Gotham City. Race to the Reactor - Watch how the filmmakers orchestrated the film's climactic chase sequence with multiple Tumblers and the Batpod. The Journey of The Dark Knight- Get insight into story and thematic choices that structured the final chapter of Bruce Wayne's journey as Batman. Supported by interviews with CN, Jonah Nolan, David Goyer. Gotham's Reckoning- The filmmakers reflect on their reinvention of Bane and all the elements that went into making him Batman's most lethal and his wardrobe. A Girls Gotta Eat- The filmmakers discuss the challenge of bringing an iconic character to life, detailing the acting choices, fashion, training and her tactical-ego of Catwoman. Shadows & Light in Large Format- Discover the philosophy and methodology of capturing The Dark Knight Rises on the grand canvas of Imax. The End of A Legend- The filmmakers give their final thoughts on working on The Dark Knight Rises and what it was like to be a part of. Please note the UV copy is only compatible in participating regions, please visit the UV website for full details. This item is REGION FREE and will playback on any blu ray player. Items sent from the UK will take about 2 4 weeks to arrive. Items sent from the USA will take about 3 - 5 weeks to arrive. All our items are 100% genuine authentic studio release items. Our ultimate goal is to see you fully satisfied with your item and our service. We want you to be 100% happy and satisfied with your order and will not rest until we earn 5-STAR ratings across all areas from you. The item "THE DARK KNIGHT TRILOGY BLU RAY COLLECTION BATMAN BEGINS, RISES BRAND NEW" is in sale since Monday, February 18, 2013. This item is in the category "Movies\DVDs & Blu-ray Discs". The seller is "zap_media" and is located in London. This item can be shipped to Australia, United States, Japan, Canada, Hong Kong, New Zealand.